My parents are coming over from Istanbul to visit us; I am over the moon (and on a roll for cooking!). For our first night dinner, I thought of making Antakya’s famous tray kebab, which holds special memories for all of us. 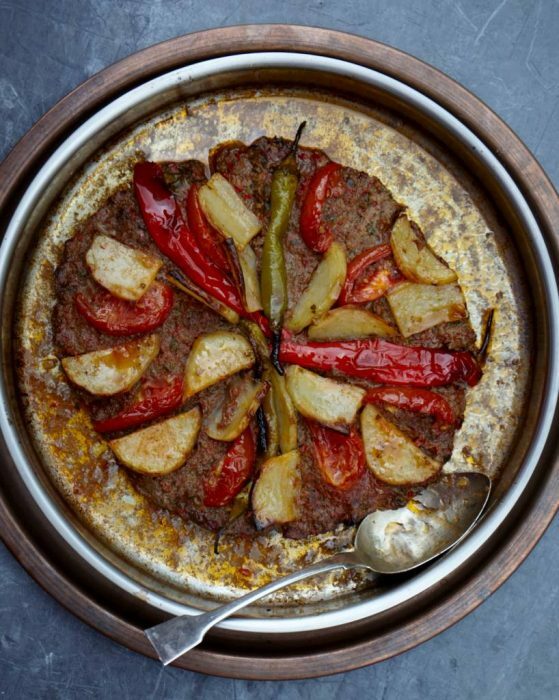 Having spent many happy childhood holidays at our hometown Antakya (Antioch), I still have vivid memories of watching my grandma and mum preparing this kebab on great big round baking trays. Then with older cousins, we grandchildren used to toddle off to Antakya’s ancient winding roads, to our local bakery for this feast to be baked. We would be back in an hour or so to pick up this delicious kebab, whose smells would fill the whole bakery, happy days. I am delighted to be able to go back to Antakya, as part of my Grand Turkey tour this summer, and look forward to sharing some wonderful photos with you all. Traditionally, locals wouldn’t put slices of potato around the kebab, though mum would, and my dad loves it, so it is in. Mum cleverly divides the kebab into wedges and inserts the potatoes along these edges. This not only helps the meat cook evenly in less time, but also the potatoes soak up all the delicious juice, just wonderful. You can cook this kebab ahead of time and can freeze the leftovers successfully. 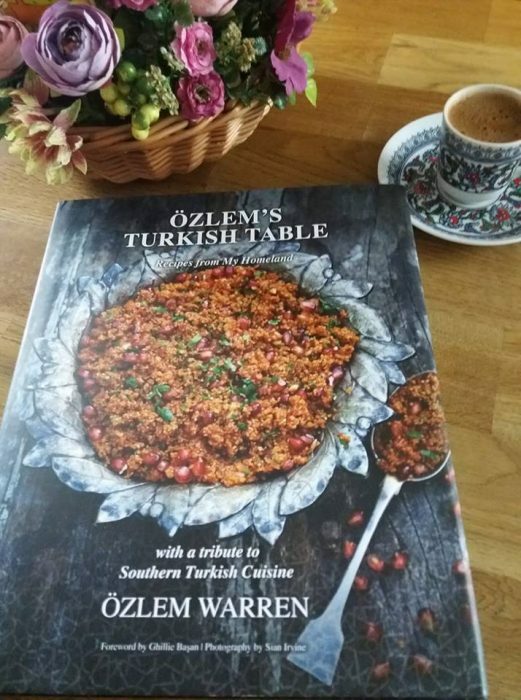 My cookery book Ozlem’s Turkish Table, Recipes from My Homeland focuses on my roots, southern Turkish cuisine and includes many authentic, delicious Turkish recipes. You can get a signed copy of Ozlem’s Turkish Table at this link, for a limited period. In a large bowl, mix the onion, garlic, red peppers, parsley, cumin and red pepper flakes. Season with salt and pepper and knead well with your hands for a few minutes, until all the ingredients combined and spices blended in. Add the ground meat to the mixture and again with using your hands, knead well until all combined thoroughly. Grease a round baking tray with a little olive oil and spread the meat mixture onto the tray. With using your hands, press the meat and spread evenly and thinly (height about 1/2″), retaining the round shape. Make sure the spread goes around the edges; once cooked, the meat will shrink an inch or two. Slice the spreaded meat mixture into wedges. Place the sliced potatoes at these edges. Spread the slices of red pointy (or bell) peppers, green bell peppers and tomatoes over the top of each wedge of the meat mixture. Season well with salt and ground black pepper. Mix the tomato paste, water and olive oil in a small bowl, season with salt and ground pepper. Pour this mixture over the vegetables and kebab. Bake in the preheated oven for about 40-45 minutes until the meat and vegetables cooked well. Serve with plain rice and some plain yoghurt, if you like. can you please put up or email me the recipe for soslu patlican i really want to know how to make it thank you, your recipes are great by the way! Merhaba Farhat, thank you for stopping by; I have a recipe for fried courgettes and eggplant in tomato sauce, you can always take out courgette, though I recommend to keep, it is delicious. Here is the link, hope you enjoy it!